Newburgh /ˈnjuːbərɡ/ is a city located in Orange County, New York, United States, 60 miles (97 km) north of New York City, and 90 miles (140 km) south of Albany, on the Hudson River. Newburgh is a principal city of the Poughkeepsie–Newburgh–Middletown metropolitan area, which includes all of Dutchess and Orange counties. The Newburgh area was first settled in the early 18th century by the Germans and British. 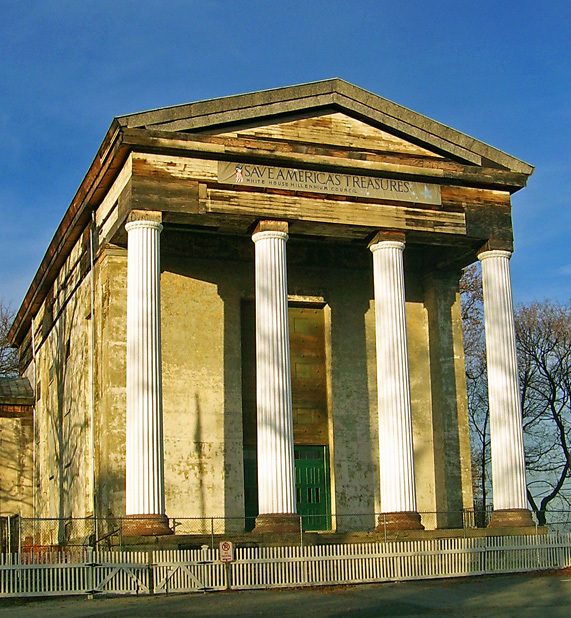 During the American Revolution, Newburgh served as the headquarters of the Continental Army. Prior to its chartering in 1865, the city of Newburgh was part of the town of Newburgh; the town now borders the city to the north and west. East of the city is the Hudson River; the city of Beacon, New York is east of the river, and is connected to Newburgh via the Newburgh–Beacon Bridge. The entire southern boundary of the city is with the town of New Windsor. Most of this boundary is formed by Quassaick Creek. The area that became Newburgh was first explored by Europeans when Henry Hudson stopped by during his 1609 expedition up the river that now bears his name. His navigator Robert Juet is told to have called the site "a pleasant place to build a town," although some later historians believe he may actually have been referring to the area where Cornwall-on-Hudson now stands. Woodcut of Newburgh skyline from Hudson in 1842, with Dutch Reformed Church, then with its original dome and lantern, prominent. Newburgh became quite prosperous during the Gilded Age that followed. In 1883, the West Shore Railroad inaugurated service to the Pennyslvania Railroad Depot at Jersey City and by 1886 was traveling to Weehawken Terminal, where passengers transferred to ferries to Manhattan. With its situation on the Hudson River, midway between New York City and Albany, it became a transportation hub and an industrial center. Its industries included manufacturings of cottons, woolens, silks, paper, felt hats, baking powder, soap, paper boxes, brick, plush goods, steam boilers, tools, automobiles, coin silver, bleach, candles, waterway gates, ice machines, pumps, moving-picture screens, overalls, perfumes, furniture, carpets, carburetors, spiral springs, spiral pipe, shirt waists, shirts, felt goods, lawn mowers; shipyards; foundries and machine shops; tanneries; leatherette works; plaster works. J.J.Nutt made this comment about Newburgh: "The year 1891 finds us the most thriving city on the Hudson, with citizens full of spirit of public enterprise, with public institutions comparatively unequalled, and with apparently every factor and requisite to ensure its bright future as a manufacturing and commercial city of importance. . .". It has been a city with many distinctions. It is home to the first Edison power plant and thus was the first American city to be electrified. In 1915 it became one of the first American cities to delegate routine governmental authority to a city manager. Broadway, which at 132 feet (40 m) in width is one of the widest streets in the State of New York , runs through the city culminating with views of the majestic Hudson River. Newburgh was one of the first cities in the country to fluoridate its water . Newburgh was hit hard economically by several factors in late 20th century and the subsequent decline was precipitous. The industrial base of the city declined as industries relocated operations south or to other locations with cheaper labor costs and lower taxes. The Hudson River, which previously served as the main means of transporting goods, lost much of its shipping traffic to trucking. The city's trolley system was shut down in 1924 in favor of buses. The nation moved to the automobile for transportation and, as with many other cities, there was a resulting migration to the suburbs. In 1963 the Newburgh–Beacon Bridge was opened, carrying Interstate 84 and spanning the Hudson River, bypassing the Newburgh waterfront and the City of Newburgh altogether. The ferry closed down soon thereafter − it was not revived until 2005 − and the waterfront area declined rapidly. In 1962, Lloyd's Department Store became the first major shopping center in the Town of Newburgh. Its motto was "Years Ahead" and the motto proved prophetic. Many features of Lloyd's, including widely divergent ministores under one roof, did not become common in other shopping centers for many decades. Lloyd's successfully drew a great deal of retail business away from the downtown area. In 1964, the Mid Valley Mall opened, also outside of the city limits in the Town of Newburgh, and attracted many long-established local businesses away from the waterfront and downtown City of Newburgh. Other retail shopping malls soon sprang up, all also outside the City of Newburgh, and the retail portion of the City was doomed. The city continued to lose its previously well regarded retail sector along Water Street and Broadway to the suburban shopping malls, which did not share the City's congested parking and traffic problems — or the perceived rising crime rate. In the early 1960s, city manager Joseph McDowell Mitchell and the council attracted nationwide attention and the admiration of political conservatives when they attempted to require welfare recipients to pick up their payments at police headquarters. Mitchell later announced a program aimed largely at blacks on welfare, whom many in the community blamed for its economic problems. The program would have denied welfare payments to all after three months except the aged, the blind and the handicapped. Those affected would have largely been single mothers of young children, the only category in which blacks were predominant. The program also would have denied payments to single mothers who had working relatives living in the city. After opposition by both state and federal officials, the program created a national controversy and never went into effect. Along with the failed urban renewal, the mid to late 1960s in Newburgh were also marked by race riots and other tensions. The last big one, in 1978, led African-American students at Newburgh Free Academy, the city's public high school, to boycott classes, and ultimately to a major reorganization of the school system. These tensions flared up again during the city's hotly contested 1995 mayoral election. Allegations of electoral fraud had dogged the city's first African-American woman mayor, Audrey Carey, since her 1991 victory in a four-way race. Supporters of Republican candidate Regina Angelo (subsequently a Democrat herself) alleged that many registered voters in neighborhoods Carey had carried heavily used false addresses. In response, four years later deputy sheriffs were stationed at polling places and challenged voters to provide proof of residency and identity. The Dutch Reformed Church, a National Historic Landmark. While the city's historic architecture, featuring historic designs by Calvert Vaux, Andrew Jackson Downing and Frederick Law Olmstead, has attracted a stable core of preservation-minded community activists willing to spend the time and money renovating houses, much work remains to be done. Part of the problem lies in the fact that the city government warehouses a large stock of in rem properties within its Historic District that have fallen into disrepair as a result of its inability to secure them. Despite progress from the early 1990s, poverty remains a major (and visible) problem. 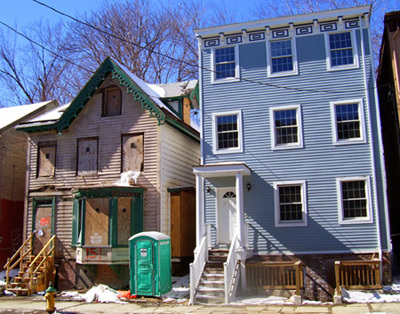 The 2000 census found that two of the city's five census tracts are among the poorest in the entire state. In 2004 the state declared it one of the state's five most "stressed" cities, based on a mix of statistics like families headed by single mothers, abandoned buildings, unemployment, residents under the poverty line and adults without a high school diploma. Local citizens and city officials blame the county's Department of Social Services for making problems worse by using the city as a dumping ground for its poorest clients. County officials respond that they are only sending people where housing costs are the cheapest. Newburgh is located at (41.503193, −74.019636). According to the United States Census Bureau, the city has a total area of 4.8 sq mi (12.4 km2). 3.8 sq mi (9.9 km2) of it is land and 0.97 sq mi (2.5 km2) of it (20.08%) is water. As of the census of 2010, there were 28,861 people, 9,271 households, and 6,123 families residing in the city. The population density was 7,413.6 inhabitants per square mile (2,856.2/km2). There were 10,496 housing units at an average density of 2,750.9 per square mile (1,058.8/km2). The racial makeup of the city was 38.33% (19.14% Non Hispanic White) White, 32.96% Black or African American, 0.71% Native American, 0.76% Asian, 0.06% Pacific Islander, 24.11% from other races, and 5.07% from two or more races. Hispanic or Latino of any race were 48.30% of the population (31% Mexican). The mayor accepts all legal process and often serves as the symbolic head of the city, but other than that has no special powers or role. The city manager, who appoints all other city officials subject to council approval, serves at their pleasure. City managers are frequently hired amidst high hopes, yet minimal criteria, and mutual resolve to do better; then fired a few years later, almost ritually and sometimes spectacularly. Since the position was created in 1916, there have been 33 managers who have served an average tenure of 2.7 years, with John Fogarty holding the longevity record at eight years in the 1950s. His term ended with his dismissal, as did eight others. In January 2009, Jean Anne McGrane, the first woman to hold the position, was fired for, among other issues, withholding an unfavorable federal report on the city's mishandling of two HUD grants from the City Council in the midst of the consideration of a $6 million bond, the 2009 city budget and the 2009 CDBG funds. The city has had five mayors and seven managers (five if two who served twice are counted only once) since 2000. Two subsequent acting city managers, after McGrane, quit. Richard Herbek, the third acting manager, took the job months later. He resigned in 2013 amid reports that he had misrepresented an encounter with a prostitute the year before. The police chief, Michael Ferrara, has replaced him on an interim basis. A recurring complaint has been that, rather than taking direction from council, some city managers have exploited divisions among members to turn it into a rubber stamp for their policies and actions and render themselves unaccountable. There have been proposals to change the situation by assigning council members towards or eliminating the city manager's position. But they have been perceived as politically motivated, and thus have not been adopted. Despite demographics and urban trends favoring Democrats, the voters of the city had until recent years regularly voted across party lines. Nicholas Valentine, Mayor from 2003 until 2011 and several other recent mayors and councilmembers were Republicans. The late Thomas Kirwan- Republican, a resident who served in the New York State Assembly until 2008—and was re-elected in a successful comeback bid in 2010, by one of the smallest margins in state history (15 votes). He died late in 2011. On March 20, a Special Election was held to fill the vacancy in which former Assemblyman Frank Skartados - Democrat, won by a large margin. In the general election held in November 2011, a newcomer to the city named Judith Kennedy was overwhelmingly elected Mayor over incumbent Republican Councilwoman Christine Bello. In addition, the Democratic candidates for Council seats, Gay Lee and Cedric Brown, were also overwhelmingly elected. Accordingly the Council is now 5-0 Democrat—the first time in memory one party monopolizes the City government. An independent documentary was made in 2004 about the mayoral race in Newburgh, called Saving Newburgh. In 2009, the Republican party did not field its own candidates for City Council. Instead, the Republican Committee endorsed two Democrats --- one a former Councilman, the other an incumbent Councilwoman --- and they were not opposed for the Republican nomination in the primary despite their being registered Democrats. The Conservative and Independence Parties both nominated them also. They lost the Democratic primary and despite their appearing on three party lines they lost the November election to two straight Democrats, both one time Republicans. The City of Newburgh is protected by the firefighters of the City of Newburgh Fire Department which has 55 members and operates out of two city-wide firehouses. The department runs a frontline apparatus fleet of four engine companies (including two reserve engines), two ladder companies (including one reserve ladder), one fire boat, one fire alarm truck, and seven support units. Newburgh's Fire Department is one of the oldest chartered departments in New York State being established by an act of the young state legislature on March 24, 1797. The earliest Newburgh fire companies were the Protection Engine Company, Cataract Engine Co., Washington Engine Co., and Empire Hook & Ladder. More appeared as neighborhoods expanded. The department purchased its first steam engine in 1872. In its inaugural test, the engine threw a stream of water over the top of the cross of St. Patrick's Church, 161 feet high, to the delight of the citizens watching. The first firefighter to die in the line of duty, Joseph Tillotson, burned to death in a fire at The Bleachery on Lake Street in 1887. In March 1889, the city purchased and installed a modern electric telegraph fire alarm system with 23 alarm boxes placed around the city, these boxes are still in service today. As horses were phased out of service, Ringgold Hose on Colden Street was the first of Newburgh's companies to get a motorized fire truck in 1907. As early as 1915, editorials were calling for the establishment of a paid fire department to assure the response necessary for a densely populated and heavily commercial and industrial city like Newburgh. Beginning with drivers, tillermen and then officers, paid positions for full-time firemen were gradually created for each company. In 1934, the volunteer companies disbanded, and a professional department was instituted by resolution of the City Council. Protection has a cost. Eight men have perished in the line of duty during the department's history: Joseph Tillotson, Willis Meginn, James Hunter, Moses Embler, Armand Santacroce, Edward Maney, Frederick Carpenter and Patrick Bardin. Rob Bell (1977-), former MLB pitcher for the Cincinnati Reds, Texas Rangers, Tampa Bay Rays and Baltimore Orioles. Geraldine Ferraro (1935–2011), a Democratic Member of the U.S. House of Representatives (1978–1984) and the Democratic Vice Presidential candidate in 1984. She was the first woman nominated for national office on a major party ticket. William S. Hart (1864–1946), a classically trained Shakesperean actor, parlayed his fame on the Broadway stage to become a star, after the age of 40, of silent movies. He was the first, and some say greatest, motion picture cowboy, famous for insisting on historic authenticity. He retired as a millionaire to his ranch outside Hollywood before the dawn of the talkies. He was born in the old United States Hotel along the waterfront in what is now the City of Newburgh which at the time had not yet separated from the Town. Lillie Howard, née Bryant (1940-), one half of the rock duo Billy & Lillie who recorded the top ten hit "La-De-Dah" in 1958 and several other records which made the Billboard charts. In later years, Lillie became a community activist and was the Democratic candidate for Mayor of Newburgh in 2007. Martin B. McKneally (1914–1992) was national commander of the American Legion (1959–1960) and was a Republican member of the U.S. House of Representatives (1968–1970). Throughout his tenure in Congress, his brother George was Mayor of Newburgh. Albert J. Myer (1828–1880), United States Army general, known as the father of the Signal Corps. Benjamin Barker Odell, Jr. (1854–1926), Republican member of the U.S. House of Representatives (March 4, 1895-March 4, 1899) and Governor of New York State (1900–1904). He was the son of a former Mayor of the City of Newburgh. James Patterson (1947-), bestselling thriller novelist. Amar'e Stoudemire, professional basketball player for the NY Knicks. Lived in Newburgh during grade school. Saul Williams (1972-), poet, actor and hip hop artist. John E. Wool (1784-1869), professional military officer in the U.S. Army who served in three consecutive wars: the War of 1812, the Mexican War and the Civil War. Newburgh is served by the Newburgh Enlarged City School District . The local high school is called Newburgh Free Academy or "NFA", and is the largest public high school in Orange County. It serves approximately 3,000 students in grades 9-12 from the Newburgh area. Two middle schools and numerous elementary schools feed into NFA. 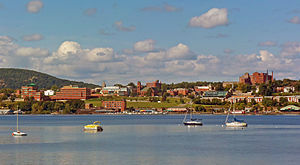 Two colleges are located in Newburgh, Mount Saint Mary College and the Newburgh campus of Orange County Community College. Newburgh, New York was ranked as safer than just 5 percent of US cities (that is, more dangerous than 95 percent of all US cities) by Web site NeighborhoodScout based on 2012 FBI crime data. This group also ranked Newburgh as the 10th most dangerous place to live in the United States based on the same 2012 dataset. It was ranked at number 12 in the previous year's rankings. In 2010, the New York Times wrote an extensive article on the gang situation in Newburgh. Newburgh is home to Delano-Hitch Stadium, a baseball stadium which formerly hosted the Newburgh Black Diamonds baseball team. Several city teams now call the field home. The Hudson Valley Renegades are a minor league baseball team affiliated with the Tampa Bay Rays. The team is a member of the New York–Penn League, and play at Dutchess Stadium in nearby Fishkill. In addition to professional and semi-pro sports, both local colleges field athletic teams (the Mount Saint Mary Blue Knights and the SUNY Orange Colts). Newburgh Free Academy also fields numerous athletic teams, the Goldbacks. The Goldbacks share a rivalry with the Monroe-Woodbury Crusaders. The Goldbacks have had a strong athletic tradition and produced state championship teams in basketball, football, baseball, and soccer. Also, the Goldbacks have several alumni move on into higher competition. These include Los Angeles Angels minor leaguer Rick Pacione and football players Mykal Myers (at the University of Connecticut) and Jalen Williams (University of Pittsburgh). ^ "Climate Statistics for Newburgh, New York". http://www.weather.com/weather/wxclimatology/monthly/graph/USNY1003. Retrieved June 2, 2012. ^ Wells, Kristina (November 25, 2003). "City Council fires Ketcham". Times-Herald Record (Ottaway Community Newspapers). http://archive.recordonline.com/archive/2003/11/25/kwmeet25.htm. Retrieved March 22, 2010. ^ James, Alexa (January 13, 2009). "Newburgh city manager fired". Times-Herald Record. Ottaway Community Newspapers. http://www.recordonline.com/apps/pbcs.dll/article?AID=/20090113/NEWS/901130338/-1/NEWS14. Retrieved January 14, 2009. ^ Murphy, Doyle (May 31, 2013). "ewburgh city manager quits amid prostitution scandal". Times-Herald Record (News Corporation). http://www.recordonline.com/apps/pbcs.dll/article?AID=/20130531/NEWS/305310367/-1/NEWS. Retrieved May 31, 2013. ^ Certified election returns available from the Orange County Board of Elections. ^ Link text, City of Newburgh. ^ Mary McTamaney, "Newburgh's Cowboy: William S. Hart", the Mid Hudson Times, December 9, 2009, page 10. ^ "Newburgh NY crime rates and statistics". NeighborhoodScout. http://www.neighborhoodscout.com/ny/newburgh/crime/. Retrieved 2014-02-05. ^ "Top 100 Most Dangerous Cities in the U.S. - 2013". NeighborhoodScout. http://www.neighborhoodscout.com/neighborhoods/crime-rates/top100dangerous2013/. Retrieved 2014-02-05. ^ "Top 100 Most Dangerous Cities in the U.S. - 2012". NeighborhoodScout. http://www.neighborhoodscout.com/neighborhoods/crime-rates/top100dangerous2012/. Retrieved 2014-02-05. ^ "In Newburgh, Gangs and Violence Reign". New York Times. May 11, 2010. http://www.nytimes.com/2010/05/12/nyregion/12newburgh.html?pagewanted=all&_r=0. Retrieved 2014-02-05. This page uses content from the English language Wikipedia. The original content was at Newburgh (city), New York. The list of authors can be seen in the page history. As with this Familypedia wiki, the content of Wikipedia is available under the Creative Commons License.